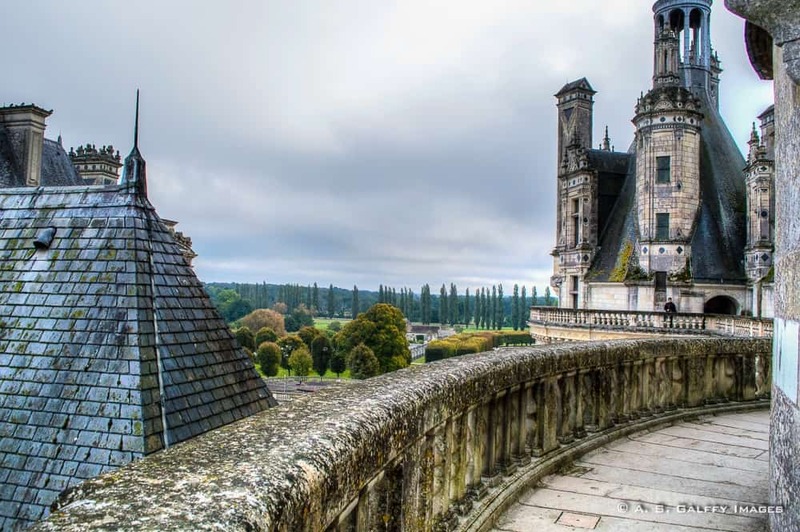 As you travel the tree-shaded road that leads to Chambord, you’ll first spot the castle’s incredible towers rising above the vast forest that surrounds it. When the entire château breaks into view, the sight is absolutely stunning. Château de Chambord is really gigantic, imposing, beautiful. It is undoubtedly one of the most grandiose buildings in France. Although it has the layout of a fortress –with a central keep and four towers– the château was always intended as a hunting lodge. François I began the construction of Chambord in 1518 on the site of a former hunting lodge built by the Counts of Anjou. The genius behind this exceptional architectural creation still remains a mystery. Some art historians attribute it to an Italian while others maintain that it is a purely French project. It is certain that many of the plans were drawn by Leonardo da Vinci. However, given his death in 1519, Da Vinci could not have directed the construction. 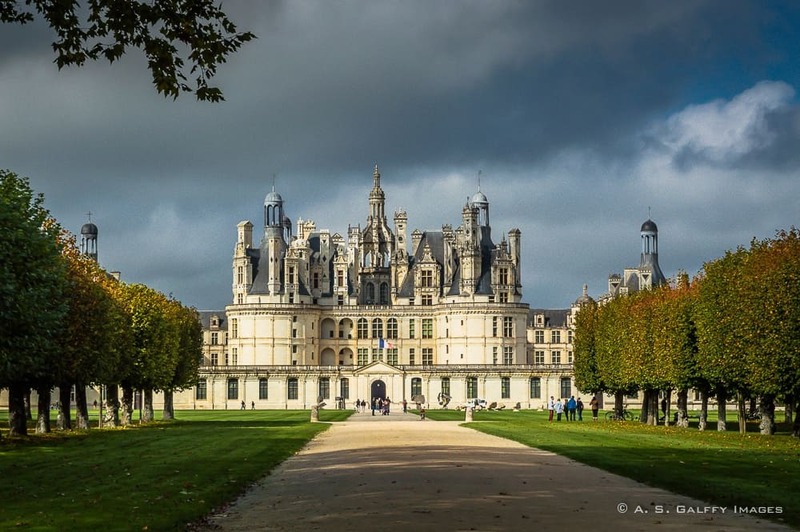 The construction of the Château de Chambord lasted for years and costed a fortune, as François I didn’t spare any expense to build his dream castle. In his original plan, he even considered diverting the Loire River to form a moat around the castle, but the project proved too challenging and expensive and had to be abandoned. The King used the château only for short stays. As it was customary at the time, the château was only furnished during the King’s visits, so 12,000 horses were required to transport his luggage, servants and entourage when he came. Built in a Renaissance style, this extravagant, white stone hunting lodge has over 440 rooms, 365 chimneys, 84 staircases, and a wall that extends 32 km (20 miles) to enclose a 13,000-acre forest. The interior of the château is not particularly impressive. Although many of the rooms are furnished, the architecture of the château itself remains the main attraction. The roof line of the castle is quite unique because it lacks symmetry. From a distance, that makes it look more like the skyline of a small fortified town rather than a castle. Walking around the rooftop terraces and seeing the panoramic views over the surrounding land is quite spectacular. The center piece of the château is the remarkable double helix staircase, one of the architectural masterpieces designed by Da Vinci. The steps on each staircase are 8 feet wide and are designed so that both the King and Queen could descend or ascend their own staircase and yet be able to see each other through the openings. The two staircases ascend the three floors without ever meeting. During his 32 year reign, François I spent only 72 days at Chambord. At the time of his death, only the keep and the royal wing had been completed. His son, Henry II, and later Louis XIV continued the construction of the castle. 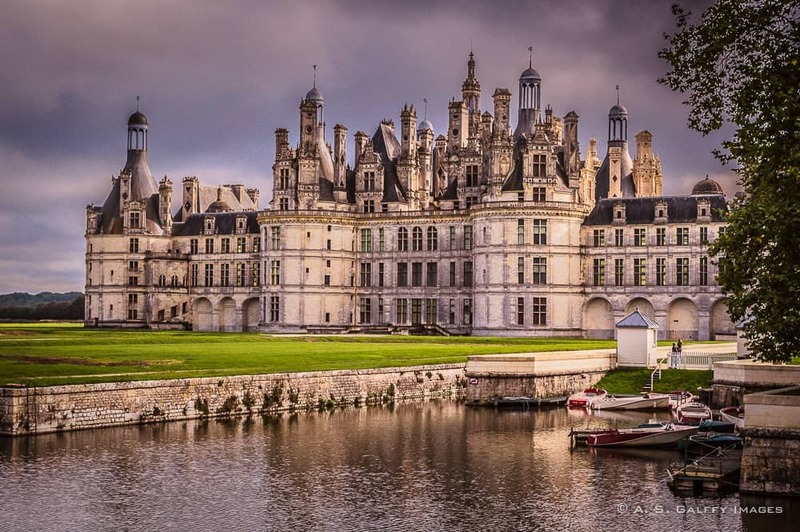 Château de Chambord is now the property of the French Nation and the presidential hunting estate. Presidents Pompidou and Giscard d’Estaing hunted here; other French presidents didn’t, but opened it to their official guests. Interview with Ashley Hubbard from "A Southern Gypsy"
The castle is huge. I like all the different towers and shapes. I never knew that the kings took all their furniture with them when they left for another castle. Ha,ha,ha, that shocked me too, Rhonda. Maybe they didn't have that much furniture and they had to carry it around as we carry our suitcases. Wow, this place is incredible. I would love to explore it. Do they require guests to be on guided tours or may you roam around as you wish? Have you seen the live action Beauty &amp; the Beast. Some of these rooms remind me of the Beast's castle, and I wonder if this was one of the inspirations for the set. The king must have been spoilt for choice with lodging to have only spent a measly 72 days here. You can actually roam around on your own in all the castles on the Loire Valley, Michelle. I really liked that. I have fond memories of seeing the castles of the Loire several years ago. It was raining when we visited Château de Chambord and I remember how big it was and how many of the rooms were empty and it was easy to sort of get lost in the empty vastness. Like you I found it more impressive from the outside than the inside. Thanks, Jessica. I would love to return to the Loire Valley and visit all the castles. One week was not enough for all of them. If this is a lodge, I certainly wouldn't mind living in Francois I's cottage! Beautiful photos Anda! I thought the same thing, Jim. I would be happy even with just a few of those rooms. I adore the first photo! The castle looks stunning but also a bit "ghosty". now with all that expense, no wonder French people got mad at some point- although we the tourists are probably paying it all back over the years! Thank you, Victoria. I think it would have been cheaper to furnish the castle rather than carrying the furniture back and forth. What an extraordinary extravagance just to spend a few days a year. 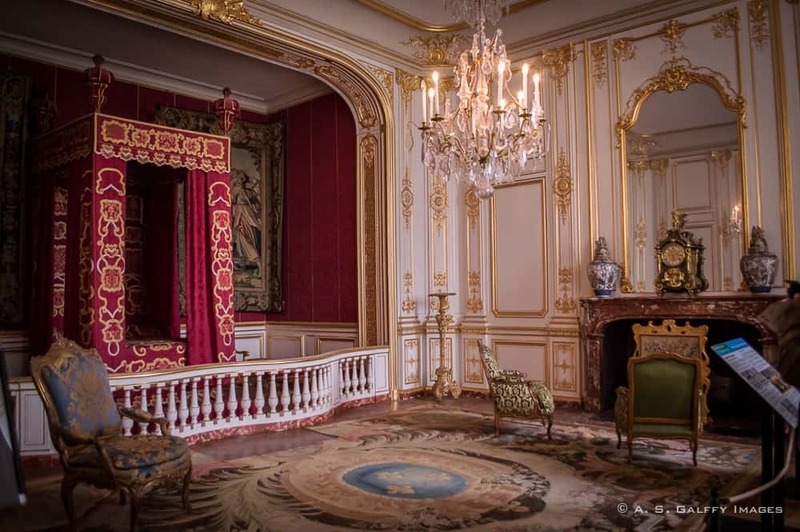 I am amazed by what you say about the furniture only being brought in when the Chateau was in use - that alone seems like a massive extravagance. Yea, isn't that funny? Furnishing the palace only when the king was visiting? I think it was more expensive that way, but he probably wanted only his expensive furniture around. Anda, Chambord is a stunning place isn't it? I love your photos...where are all the people? Gorgeous. They were around, but I try to avoid them when I take pictures. It's an incredible place isn't it though a bit freezing inside when we visited. We have friends who lived in Blois at the time and we cycled from there to the castle! Interesting that you are saying that, Suze. I thought so too. I guess it's the size of this castle that makes it feel cold. It's so huge, I find it hard to imagine how they could warm it up in winter. The helix staircase looks awesome! Can you imagine sitting with an architect saying 'oh, we'll need about 440 rooms..."? Yea, it's funny to have all these rooms in a hunting lodge. I imagine the king always invited a huge entourage when he came hunting, that's why he needed the rooms.